Although this page has a lower Mombubot score it still ranks quite well. We have seen this before in other pages reviewed. There are some key locations which have the keywords. The Title bar, description, frequency and prominence together with all or in this case part of the keyword in the URL all help with the good position. However, in this case if you were looking for software for your horse you would not have been taken to the correct page. As the search engines try to organize sites the best they can do is work with keywords and try to figure out the category for pages. This site should really be put with the other software developers creating web sites and design. 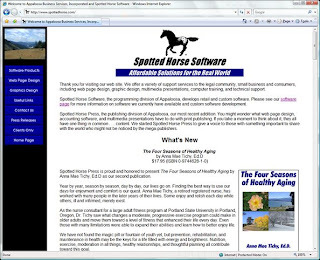 So if the owner of this page is hoping to be ranked with the software developers the focus on their business name "Spotted Horse Software" can cause an issue. If your business name doesn't reflect the category you are going after, you have to NOT make it the focus of your page. Again, go back to your keywords and focus/highlight them!